Join us at noon on Monday, Jan. 23, in the Library Conference Room as we discuss the first title of the new year for the Webster University Book Club. Everyone is welcome! Life, Animated: A Story of Sidekicks, Heroes, and Autism is the true story of Owen Suskind, a boy with autism who was unable to speak. He and his family found a unique way of communicating using dialogue and songs from Disney films. 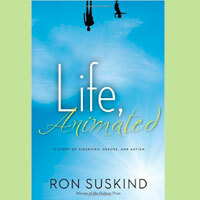 The book is written by Owen’s father, Pulitzer Prize winner Ron Suskind. This is a tribute to the power of stories in our lives and relationships.